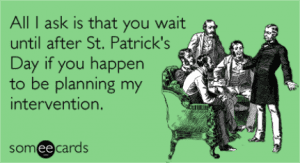 Happy St. Patrick’s Day Weekend! There are a lot of fun and inexpensive things happening this weekend, some festive and some not for the third week of March. St. Patrick’s Day Parade: Sunday, March 17, 2013 at 1pm in South Boston. Celebrate St. Patrick’s Day at the second largest parade in the United States. Free. (Or find another Massachusetts St. Patrick’s Day parade this weekend here). “Shamrock” Your Body: Sunday, March 17, 2013 from 9-11am at BSC Wellesley and BSC Wellington. Enjoy a free workout with Irish music. Free Guitar Lessons at Guitar Center: Saturday, March 16, 2013 at 10:15am at your local Guitar Center. Every Saturday during the month of March, receive a free Guitar lesson at your nearest Guitar Center. Harvard Art Museum: Saturday, March 16, 2013. From 10am-12pm on Saturdays, Massachusetts residents can explore the museum for free with proper Mass ID. Harvard Museum of Natural History and Peabody Museum of Archaeology and Ethnology: Sunday, March 17, 2013. Mass residents can visit the Harvard Museum of Natural History and the Peabody Museum of Archaeology and Ethnology for free on Sundays from 9am-12pm with proof of residency. City Sports 30th Grand Opening: Saturday, March 16, 2013 starting at 10am at City Sports Chestnut Hill. City Sports is celebrating their 30th Anniversary at the Grand Opening of their newest location at Chestnut Hill with former Patriot Matt Light, free Pinkberry Treats, giveaways, and more! Be one of the first 100 through the door for a bag filled of goodies and a City Sports Tee. Also, Sunday is the start of Boston Restaurant Week! More information can be found here. If you are heading out and looking for some cheaper eats than Restaurant week, check out my cheap eats page here. Also, apparently dbar will have green beer for $3 on St. Paddy’s day starting at 11am ’til they are out if you are interested.